Of the many wonders of the world, the Great Wall of China certainly stands as one of the most intriguing. Built as an ancient defense against the Manchurians to the north, the Wall, stretching some 4,000 miles across China, is the only man-made structure on earth visible from outer space. The Wall itself varies quite a bit from region to region. Sections are built with different materials, such as rammed earth, stone, or brick, according to locally available resources. Thousands of men were forced into service to construct the Wall, which is wide enough in some sections for six horses to ride abreast. 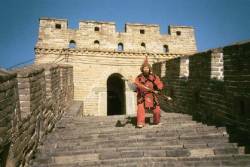 Up to one million soldiers manned the Wall from fortified passes and more than 10,000 watchtowers. Any environment would demand excellent engineering and construction skills - and a tremendous amount of perseverance - to build such a structure, but the mountains of northern China are not just any environment. Winters are relentlessly harsh, summers cruelly hot, and the precipitous terrain would seem to prevent any large-scale construction. Under imperial edict, though, the Chinese built and maintained the Wall for 2,000 years. From Beijing, visitors can view the Wall at Badaling, Mutianyu or Simatai. Badaling, closest to Beijing and probably the best-restored section, is also the most crowded. Mutianyu is quieter and offers a range of restoration, from solid and pristine to crumbling and overgrown. Simatai, featuring some of the most unique architecture of the entire Great Wall, is considerably deteriorated and situated in particularly steep terrain, providing a strenuous hike for visitors. Mutianyu offers, for most tourists, the perfect combination of preservation, ruin and easy access. From the parking lot, the Wall is a moderately challenging 15-minute hike up a well-maintained path. Upon reaching the Wall, one can walk in either direction from watchtower to watchtower, where friendly vendors in period costume peddle books, postcards and other Wall memorabilia. For those who prefer riding to walking, a gondola provides a stunning trip to the top of the Wall, and one can even slide down the steep rise in a year-round toboggan track. Perhaps the Wall's most surprising attraction is just down from the gondola station -- there, at the top of the wall, is an International Direct Dial telephone, where one can phone home for somewhere around $3 per minute! The Wall, clinging precariously to ridges and marching diligently over mountain after mountain, often leaves visitors speechless, or grasping for superlatives that still do not capture the majesty of the spectacle. Richard Nixon and Bill Clinton, two American presidents not known for lack of words, were stumped to describe the Wall. Nixon was heard to exclaim, "This really is a great wall!" while Clinton simply repeated, "Amazing, amazing," as he took in the view. What words cannot describe is also rarely captured in amateur photos, so when you visit the Great Wall, be sure to buy a book and some postcards from one of the many vendors, and to take a long last look before you descend the hillside - your memory will be the best record of the wonderful experience. Getting there: From Okinawa, Beijing is reached by flying through Shanghai (also a worthy destination!). Once in Beijing, consult your hotel or tourbook to find out about busses to Badaling or Mutianyu, or, for optimum flexibility, hire a taxi for the entire day. This will allow you to spend as much time as you like at the Wall and, at less than $100 for the day for up to four people, it is well worth the investment.